It feels like it was just yesterday when I launched SharewareOnSale, despite the fact that we are almost at our three year anniversary. Time has flown by! As we near our three year anniversary, we have continued to innovate at SharewareOnSale to make us more competitive in the highly competitive tech space. This post is to recognize our success over the past three years and to highlight some new changes at SharewareOnSale. Over the past three years, we have grown to 787,705 members that have downloaded our 3,220 offers roughly 5,402,164 times. And we continue to grow at a breakneck speed! Lovin’ Mac, Android, and iOS — and games too! Whereas SharewareOnSale originally started off focusing on Windows software, we now offer exclusive giveaways of Mac apps at our sister website MacAppsOnSale and feature regular giveaways and discounts of Android and iOS apps at HungryForApps. On top of that, we offer weekly game giveaways at FAILMID. Whew. That is a lot. UPDATE: We’ve made changes to Download Hub based on your feedback. Click here to learn more! 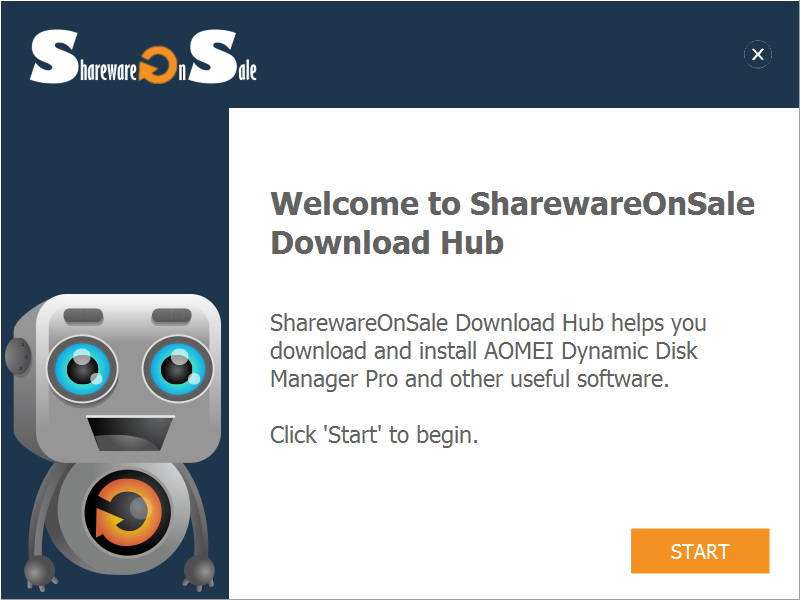 We have introduced our new SharewareOnSale Download Hub and SharewareOnSale Daily Giveaway Notifier. 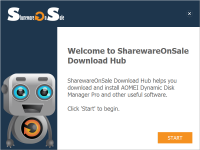 SharewareOnSale Download Hub is a downloader that assists you in downloading and installing our giveaways, plus gives you the option to download and install our SharewareOnSale Daily Giveaway Notifier. 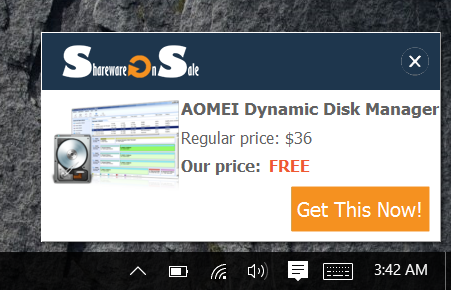 SharewareOnSale Daily Giveaway Notifier is a small program that provides you with desktop notifications whenever we have a new giveaway on SharewareOnSale. Please rest assured, our Download Hub and Daily Giveaway Notifier are completely safe. We do not install anything on your computer without your explicit permission; you are asked “Do you want to download and install” for every download / offer in the Download Hub and you must click “Yes” or “No”. If you click “No”, that particular download / offer is not downloaded and installed. We will never, ever download and install anything on your computer without your explicit permission. 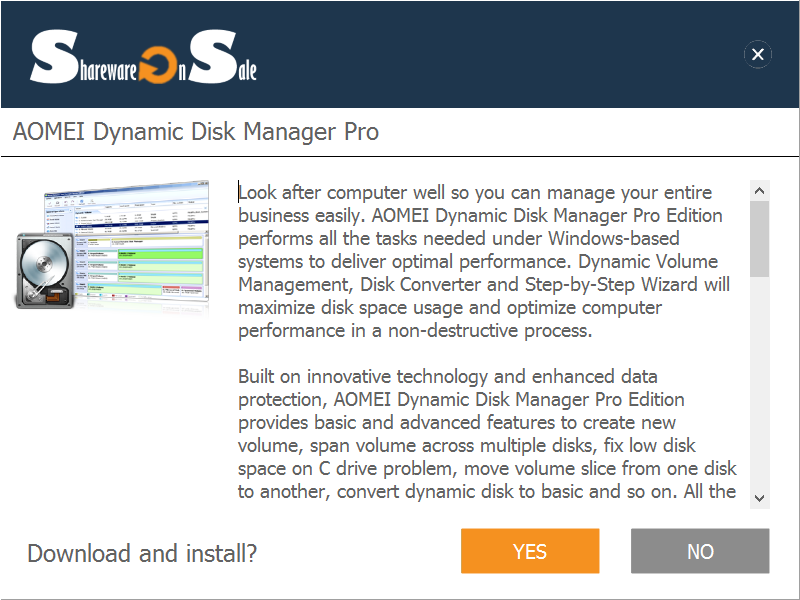 If you click “Yes” to download and install the main giveaway, our Download Hub downloads the installer (or portable files, if it is a portable program). After the installer is downloaded, Download Hub launches the installer — we do not automatically install it for you. You go through the installation steps of the main giveaways. If you click “Yes” to download and install our Daily Giveaway Notifier (screen to the left is an example of the desktop notification by Daily Giveaway Notifier), we automatically install and set that up for you — you need not do anything further except for clicking “Yes”. You can easily uninstall Daily Giveaway Notifier from Add / Remove Programs at any time, if you decide you no longer want it. If you have any questions, comments, or concerns about our new Download Hub or Daily Giveaway Notifier, please send me an email to admin [at] sharewareonsale [dot] com and I’ll be glad to assist. As we continue to bring you awesome new giveaways and discounts, we need your help. What can you do? Firstly, come back daily and take a look around. If you don’t find anything that you want, no problem! You never have to download / purchase anything that you don’t want. But, please, do come visit us. Aside from coming to SharewareOnSale, spread the word about us! Email your friends and family; share our offers on Facebook, Twitter, Google+, etc. The more people that know about us, the better offers we can bring you. We will continue to innovate in order to improve our services, and we hope you will continue to join us on this exciting ride. Will you please clarify if and how there is an option to download and later install the programs in your new hub? 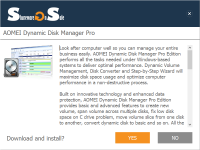 People sometimes do not have the time to install immediately or would like to test in a virtual machine before to decide to install the program. Having nothing but problems with the Aug 13 offering (Photo Pos Pro). I have repeatedly downloaded the hub link but when I click on it all I see is the “Windows cannot access the specified device, path or file……..” pop-up. Thanks for SharewareOnSale. Been with SOS for years downloading software. Happy Birthday! I wish you many more successful years ahead ! @Mac: We already prefill all the fields for anyone that has downloaded from us before. Are you allowing cookies from our website? Happy Anniversary! Like the other commentators have said, I am very appreciative of the site, your reviews, and the opportunities the site provides. Keep up the great work and services – who doesn’t like freebies! Thanks once again, Ashraf, for this excelent Giveaway. I´ve been followed you since the very begginning and this website is probably the very best online that I know of. Keep up with your excellent work. P.S. For the registered users, please insert a field “(Allready registered?) Insert your email” to login. Step 2: Fill out this form and click “Give It To Me Now” when ready. Wish you health and happy continuation of all your endeavors. I have been following you for years on various give-away sites and forums. Your judgments/verdicts have always been as valid as any online. Plus, this website is probably the the best online that I know of. The internet is better for having you so involved. Many Many returns of this Day . Congrats on your 3rd Birth Day . Keep it going with your excellent Free offers . Wish you Get us more and more 100% free giveaways of the Top Leading Softwares . Thanks for helping Many needy persons with your Beautiful giveaways . Thank you for your work and for all the great software! Thanks for all the free software to check out keep or to buy. I enjoy yr offers of software Thanks a lot.